This Advent devotional offers an exciting and fresh way for your family to prepare for Christmas. Right from the beginning, the serpent lied to Adam and Eve in the garden of Eden – and he has been lying ever since. But right from the beginning, God told us his amazing plan to send Jesus. Each of the 25 readings looks at one of the serpent's lies from Genesis 3, and then shows how the glorious truth of Christmas beats it every time! There is even space for each family member to make their own notes. So get each family member a copy of A Jesus Christmas and a Bible, and find ten minutes a day in December to look at God's word together and dwell on the good news of Christmas. 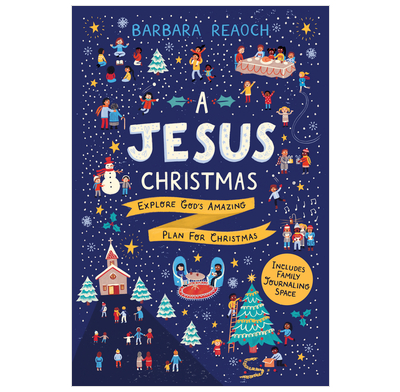 In A Jesus Christmas, Barbara Reaoch introduces children to the amazing truth that God planned the first Christmas long before Jesus was born. Barbara takes us on a journey through the Scriptures showing us the signposts that point to the coming Savior and its fulfillment on the first Christmas Day. An excellent family Christmas book with a powerful gospel message. With every Christmas becoming more commercialized, parents are earnestly seeking new ways to make the true story of Christmas much more clear to their children. One glance through this remarkable book tells me that "A Jesus Christmas" is just what mothers and fathers are looking for. What a great family project this is, providing guide points for discussion, age-appropriate activities, and "homework" for every child. I highly recommend this book as a practical and powerful way to keep Jesus Christ and his Word at the very center of your family’s Christmas. With its focus on the good news of Christ, A Jesus Christmas is the perfect gift about the Perfect Gift. This easy-to-use, 25-day advent devotional will engage children and families with interactive questions and space for creative journaling. Barbara Reaoch wisely guides even young readers through the story of redemption, always stopping at signposts along the way that point the heart to Jesus. This book was very helpful as we sought to focus on the birth of Jesus this year. The book basically went through the whole Bible and helpfully pointed to how Jesus's birth did away with the lies Satan has been telling the world since creation. It was very age appropriate for our kids aged between 4-9. It had easy comprehension questions for the younger ones and more contemplative questions for the older ones. I think there could have been more questions on each devotion, but only because our children love answering questions! Altogether, and very Bible-centred book. My wife and I recently decided to start doing daily family devotions with our four year-old (as a sort of graduation from storybook Bibles), and thought that the Christmas season would be a perfect time to begin. We wanted something that would present the Word and point to Jesus, rather than the type of devotional that provides a scriptural snippet followed by four paragraphs of reflection. The sample pages of <i>A Jesus Christmas</i> looked promising, so we decided to give it a try. Well, I can't tell you how glad I am that we did! Our daughter engaged in the discussion questions night after night, and loved the journaling/doodling pages. Halfway through the book, she told my wife that she wanted Jesus in her heart, and they prayed for that together (naturally, on the one evening of the week when I'm out of the house, haha). At the very end of the devotional, families are prompted to write down what they've learned about Jesus, and she said, "That Jesus is King, and he gives us life!" To Mrs. Reaoch and the folks at The Good Book Co., thank you for making this available. The Seders family has been blessed by it! Note: for the selections of Scripture, our family turned the NIrV. The NLT would also be suitable. Whatever you choose, the important thing is that you engage the Word together! This is a helpful book for our family, with children aged between 9 and 2. I like the fact that it's a bible overview, rather than starting at the New Testament, as this should give us a better persepctive on the coming of our saviour. The journaling space is a nice idea, although all four of my children want to do that so I've had to photocopy those pages! This will be an excellent family devotional book for December. Beginning in Genesis and working through God's plan for salvation it clearly and helpfully shows Jesus to be the Saviour God promised and the world needs. With plenty of questions and space for children to draw it caters to a range of ages. This book will help to put ensure Jesus is the focus during the Christmas period. Our three boys (7, 5, 2) ask to do our devotional all throughout the day. Barbara Reaoch's "A Jesus Christmas" is far and away the best devotional we've done as a family, Christmas or otherwise. Each devotional begins with a scripture reading followed by 2 questions to make sure everyone got the main points from the text. Next, Reoach shows how Satan's lies are refuted and dismantled in Christ's Incarnation. She masterfully covers deep theological truths in simple and short ways that kids can understand. Lastly, there is a family journaling page with creative prompts to repond to the devotion with art. This will be a book to look back on for years to come and enjoy the memories of studying God's Word together. Our family has had some major lightbulb moments throughout this devotion like the story of a mother bird protecting her chicks from a fire. Our son said, "I get it!! Jesus took the punishment we deserved. He died so we don't have to!" "A Jesus Christmas" is the perfect way to prepare for Christmas. We couldn't recommend it more highly! Our family has really enjoyed this book. There are specific questions for older children as well as younger children. So my 4 and 6 year old are able to listen to the Scripture verse we are studying and digest it's meaning. It's led to a lot of great discussion about sin, Jesus, and God's love for us. As a mom of littles, I really appreciate that each chapter takes only 5-10 minutes--it keeps their attention and allows them to focus on the one attribute about Jesus for that chapter without getting bogged down in other stuff or losing focus. And the journaling at the end of each chapter is by far our favorite--my boys LOVE drawing about what they've learned and I love seeing what they come up with! It allows me to see that they really are understanding the concepts. Such a great way to prepare our hearts for Christmas--highly recommend!! With the continued commercialization of Christmas in our culture, even Christians can find themselves looking forward to the peripheral benefits that come along with this season. We occupy our time by getting together with family and friends, putting up a tree and lights, special programs at churches and schools, to name a few. These are not bad things, but they are lesser things. If we can focus on JESUS during Christmas, these lesser things will be more meaningful while taking their rightful place. This 25-day devotion draws the family into studying the promise of CHRIST starting with The Fall of man and continuing to the Incarnation of the Rescuer. Each day along the way, a lie that the serpent tells us is dispelled by a truth of JESUS. As parents, we praised GOD as our little ones recognized these lies of the serpent and the truths of JESUS. These lies are practical statements that the god of this world is speaking into their lives, but they are not without hope. For each lie is met with Scripture, and Scripture wins because Scripture testifies of JESUS, our Rescuer. As a family, we've done a number of advent devotions, but this book is exceptional. The devotions are engaging and interesting. They are the perfect length for a busy family, and with graceful simplicity go deep into the gospel and the heart. Thanks to two "levels" of questions, they are great for both older and younger children. My kids are 9 & 12 and we have had some wonderful discussions around these questions. Each day, a lie that the serpent tells is countered with the truth as Bible stories which point to the Messiah are shared. The Gospel is beautifully and clearly woven into each devotion, building the anticipation for Christmas, just as it was longed for so many years ago. I highly recommend it! Our family of 7 (kids ages 1 to 13) loved our A Jesus Christmas devotional. It is rock solid in terms of scripture and uniquely allowed us to examine a lie told by Satan versus a truth of Christmas that invalidates the lie. There were questions for younger children and older children as well as some that invite the parents to share to get the discussion going. One of the other unique aspects of this devotion is the journaling page for each day. The kids (and parents) loved brainstorming and creating images that reflected what had been discussed. This is a great devotion to move Christmas related discussions beyond the surface to grasp the real reason why Christ coming as a baby matters for all mankind. This is the family Advent devotional I've been looking for! Easy enough for my 9 and 7 year old to read aloud to us, keeps my 5 year old's attention, and filled with Biblical truth that blesses and challenges all of us. My kiddos have also loved processing and applying what they've learned through the journaling pages. I just bought several to share with family and friends because it's been so helpful to our family.